Give your children an unforgettable Christmas gift with these stockings! Can be used as Christmas gift bags, candy bags or Christmas tree decorations. 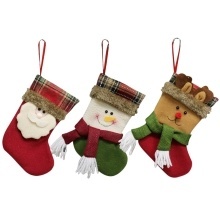 3 different hanging stockings: Santa, snowman and reindeer. Made of light and soft flannelette and non-woven fabrics.